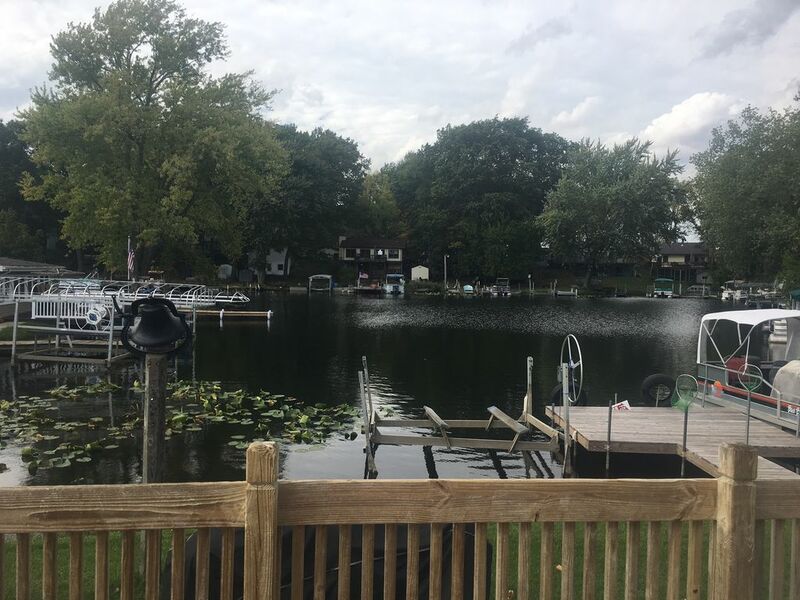 A three bedroom two bath house on the channel at Gravel Lake in Lawton Michigan. Less than two hours from Chicago, this beautiful home sleeps eight, has a two slip dock and available lake equipment. Gravel Lake accommodates all lake activities including boating, swimming, skiing, tubing and fishing. The Lake is considered the best ice fishing location in southwest Michigan. So stop dreaming and book your reservations now. Large open living room area with 2 sofas and several comfy chairs. One of the sofas folds our to queen sleeper adding accomodations for 2 more to sleep. Fully stocked kitchen including dishes/glasses/silverware. Complete with cooking pans and bakeware. Flat screen TV available but NO CABLE. Feel free to bring a HDMI cable to stream movies or videos from other sources.. IE apple TV, fire TV, infinity or hulu. Gravel lake is nestled in the middle of Michigan just south of 94 at exit 60. The town of Lawton has many fun eating establishments. Pawpaw which is a 10 minute drive also have many quaint restaurants and wineries. Many other wineries and breweries located within 30 minutes. We went in the winter, so we really just needed a place to stay for 5 of us for a 3 day weekend getaway. Comfortable accommodations, everything we were hoping for. We were beyond impressed and happy with our stay!! Very clean, very accomodating! We Will absolutely stay again! Thank you, Sue! Glad you enjoyed your stay. Come back and see us again when you can stay a bit longer and enjoy the lake. We spent our family Thanksgiving at the Channel House. The accommodations were perfect for our family of 6 adults. The house is clean and inviting. Best of all, the kitchen was perfectly stocked for all the cooking that we did! No lack for pots/pans/serving dishes, which really made preparing the Thanksgiving feast a joy. I would definitely recommend this location for a family gathering. Thank you to our hosts for sharing their home with us. The property was very clean. All of the kitchen tools that you could want were readily available. Was happy to have WiFi. The house is spacious and very comfortable for our party of four. We did fish off of the dock and caught some fish but were not able to spend much time fishing because of the very windy and cold air. We will certainly consider going back again perhaps when it's a bit warmer. We recently came to the channel house for a scrapbook week-end. House was perfect for the four of us. With the two bathrooms we didn't have any problems getting ready. Kitchen was great to have with for most of our needs. We were there in the spring and I was there in the summer for a fishing week-end. The local party store had great pizza. Big T's is a great restaurant in Lawton. Sue answers any questions we have promptly. We had a wonderful time staying in the Channel House this weekend. The place is very clean, nice deck and dock. The kitchen was well equipped with everything we needed. We would recommend it and would like to come back again.